Wantaway Manchester United superstar Paul Pogba won back the hearts of fans with a spectacular assist in this afternoon’s Premier League encounter with Wolves. 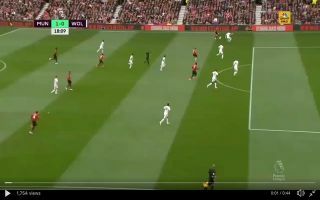 In the 18th minute of the match Pogba showed very impressive reactions and composure to pass the ball into the path of teammate Fred who fired home with an excellent finish. He has his faults but bloody hell Pogba is capable of so much. The assist for the Fred goal is outrageous. Pogba's passing range is just unreal, he can slot a 40-yard crossfield pass but has the touch to play it quick and short. Worth every penny of 100M. That Pogba touch should be illegal. Unreal assist. Great finish from Fred too. Get in. With Manchester United looking to have put a slow start to the season behind them Jose Mourinho’s Red Devils could well be a force to be reckoned with in this season’s Premier League title race.